The older we get, the more troubles come our way, no matter how much money you have. You can be the richest man in the world, but this does not guarantee against any kind of sickness or accidents that might just happen. After all, accidents do not pick out their victims (although some victims seem to be searching for trouble more often than not on purpose), and with age, it would be prudent to make sure that we all do of our part to take good care of ourselves. For instance, as we age and our eyesight starts to fail, not to mention reflexes begin to slow down, it would be wise to drive all the more carefully, especially when it is raining or when you are at the wheel at night. Another major danger for older folk would be falls, and statistics show that one out of three people age 65 and over falls, which ends up in injuries and even death. Having said that, the elderly are recommended to use walking aids such as canes or walkers, but many refuse, seeing them to be symbols of weakness and dependency. How about the B-Shoe then, that does not come with any of the stigma? Humans tend to gain their balance by moving a leg backward (“backward step”), which increases the base of support, but because of deterioration in balance functions and reflexes in the elderly, the backward step tends to be taken too late, in a slow and inaccurate manner, that results in a fall. 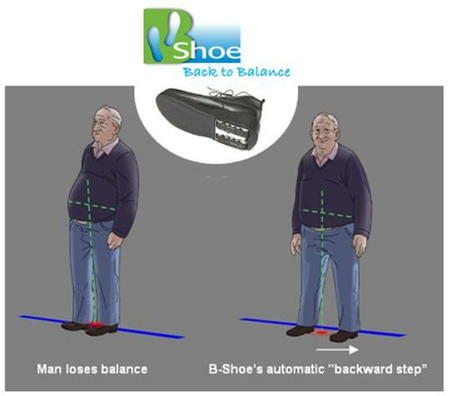 The B-Shoe prevents that by detecting a person who is about to lose his or her balance, where it will then automatically drive one leg slightly backwards, in order to prevent the dangerous fall. The clever implementation of ultra-light components makes the B-Shoe’s balancing mechanism possible, where it is accompanied by insole pressure sensors, a driving mechanism, a rechargeable battery, a microprocessor and proprietary smart algorithms.